Friends, I'm excited and sad to announce that I'm going to be passing on my role as blogger; this is my last post for MSFM. I've loved sharing recipes from my table with you over the last few years, and am thrilled to leave you in good hands with Heather Thacker, our new recipe blogger. Heather is deeply invested in our local food community and farmer's market: she was the baker for The Farmer's Daughter and is an assistant cheesemaker at Sequatchie Cove Creamery. If you'd like to say hello and try some of her favorite treats, inspired by our own Sequatchie Cove Farm produce and Sequatchie Cove Creamery cheeses (including cookies, biscuits, tarts and brownies), stop by the summer Pop-Up Collective from 4-9 p.m. this Friday at 1810 East Main Street, Suite 100. Heather hopes to see you there and looks forward to sharing recipes and seasonal ideas on this blog. It's finally tomato season, aka, the most wonderful time of the year. 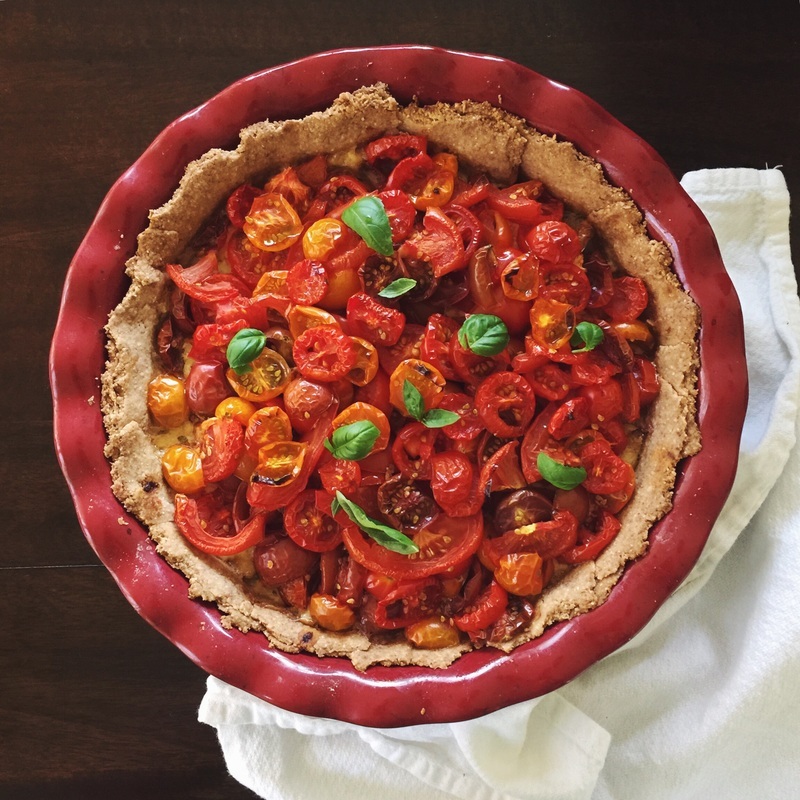 Tomato pie is new to me, but since it features my favorite item of summer produce, I figured it had to be worth a shot, right? It is. This recipe is somewhat more time consuming than my usual fare, but worth each step. Stock up on all the goodies you need at the market on Wednesday and make one for yourself this weekend. Make two if you plan to share, because just saying, these are gooooood. enough ice water to bring the dough together, about 3 T.
Mix together the dry ingredients in a large bowl; I like to use a whisk for this. With your hands, rub the butter into the flour mixture until it feels like damp sand but still has pea-sized pieces of butter visible in the mixture. Slowly add ice water to bring the dough together. Form into a disk and chill for 20 minutes. Roll out the dough carefully on a parchment-lined or very well floured surface. Because the flours you are using are so nubbly, the dough may want to break apart on you, so go slowly and gently. Transfer to a pie dish; if the dough breaks apart, pat it back together so that no cracks are visible (no one will know). I'll be honest, I don't bother to crimp the edges or try to pretty it up. This is a rustic, homey dish and a crackly edge around the pie works just fine for me. But make it as fancy as you like. Prick the surface of the dough with a fork and chill for another 20 minutes. Line the crust with foil and fill with dried beans or pie weights. Bake for 20 minutes, remove the weights and bake for another 10, then set aside to cool. In a large skillet, heat the olive oil over medium heat until shimmering. Cook the onion, stirring occasionally until translucent and beginning to brown. Meanwhile, slice your tomatoes. Quarter larger tomatoes and cut into 1/4" slices, cut small tomatoes crosswise into 1/4" pieces, and halve very small tomatoes, such as Sungolds. Place the cut tomatoes in a colander, sprinkle with 1 t. salt and gently mix with your hands. Allow to drain while you continue with the other preparations. Mix together the onions (drain excess oil first if any remains in the pan after cooking), bread crumbs, mayonnaise, basil, cheese and salt and pepper. Spread gently into the bottom of the cooled pie shell, and then top with the tomatoes. get artsy with this or dump them in haphazardly and gently even out the filling. Bake for 45-50 minutes or until the crust is well set and the tomatoes have begun to brown. Cool and serve slightly warm or at room temperature.